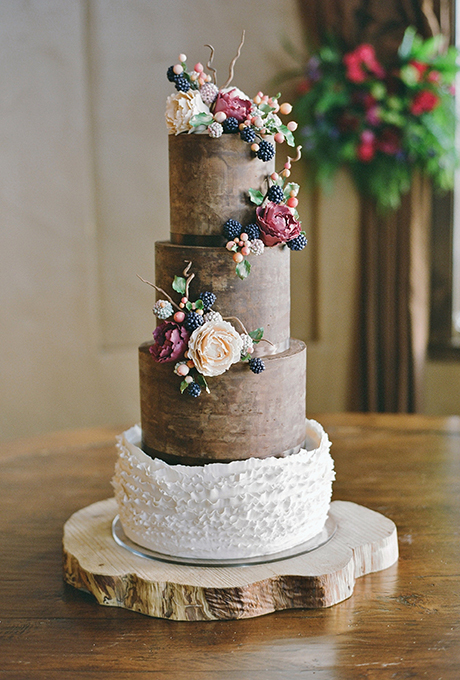 I love the rustic vibe of this cake from the chocolate ganache icing that gives the cake a “woodsy” feel to the dark fruit and flowers used as accents. Each tier is accented with what looks to be dark satin ribbon, which adds just a touch of glamour to the cake. The light colored flowers and the dark berries are the perfect embellishment if you’re going for a rustic look. This cake would be ideal at a fall wedding. The cake was created by Sweet and Swanky Cakes. You can find it here.